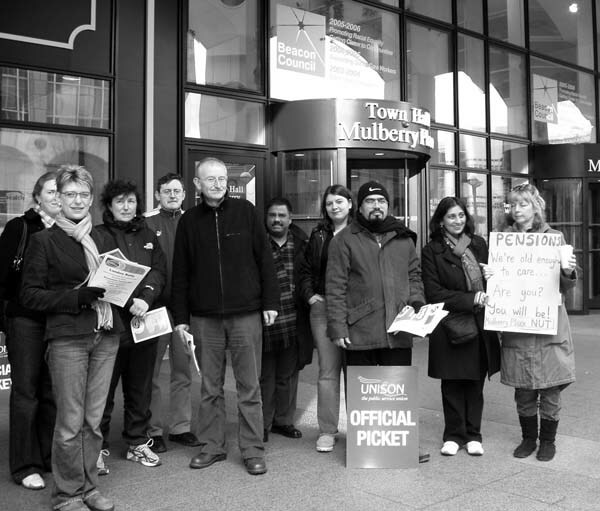 Council workers in east London borough Tower Hamlets came out in force on the March 28th strike to protect their pensions. In an unprecedented show of unity, workers in Unison, GMB, TGWU, NUJ and NUT joined picket lines around the borough, then met to hear each other's news in a local rally before travelling to Westminster to the London-wide strike rally. Many council buildings and schools around the borough were shut by the action. All the transport depots except one were closed. Helpfully, the employers sent round an email before the strike calling on workers who wanted to work to go to one depot which they would try to keep open on the day – so pickets knew where to concentrate their forces. In the event, only five coaches crossed the picket line. At the Professional Development Centre for teachers all courses had to be cancelled, and 40 visiting American teachers who were to have been given a reception there were handed a list of London tourist sites to visit instead. One US teacher came to visit the picket line first to express sympathy – they are having trouble over pensions too. Although strikers did not manage to close the Town Hall, less than a third of the normal 1,000 people went to work – many of them agency and contract workers who were not members of trade unions, a weakness which needs to be addressed. Nevertheless, deliveries were turned away. The police, who had apparently been asked to come to check pickets were acting legally (probably by Labour councillors), came over to chat in a friendly way about their own pensions. In spite of the by-then large crowd of pickets in front of the doors, they declared they couldn't see anything illegal happening!